For all those who love a good slice of pizza, and for those who can’t get enough of flavors from the Indian subcontinent! Tiffin etc is here to the rescue. Here is perfect example in what i believe that Indian food can be fun, chic, light and refreshing. A trip to the city of Philadelphia and you can taste something that is unique. 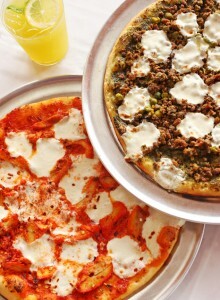 Traditional pizzas with Indian flavors and Indian street style drinks. It took me a few months of testing (and tasting) and re-testing the flavor combination of bold Indian flavors with thin crust homemade dough and fresh mozzarella. What we came up with is 6 different pizzas each with has its own homemade sauce and toppings. wish i could get this delivered to Chicago ! you have to try freezing this and selling in supermarkets!